similar in style to the sr-4148r, this model has a similar function set having two memories, exponent ranging and stats and dates from around 1976.
one significant difference is the vacuum fluorescent display rather than led. these are larger and clearer making them easier to read. oddly, this model will only display 8+2 digits (the sr-4148r is 10+2) but underneath it is actually a 10 digit machine, having 12 significant figures internally. so when no exponent is present, the right two digits are blanked rather than be used to display a 10 digit result (there are actually 12 digits on the vfd). it is identical in function to the desktop model 1540 having the same chipset and giving identical answers. 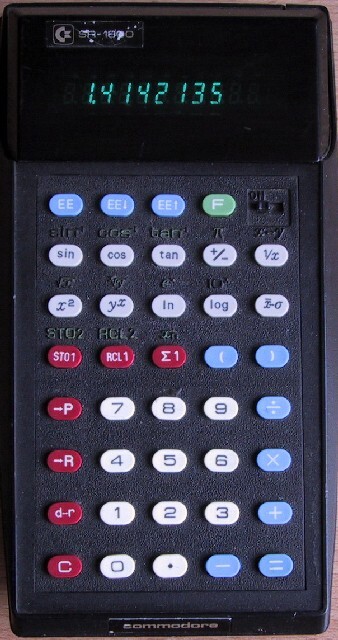 interestingly, the 1540 displays the full 10+2 digits and displays a ten digit result when no exponent is present. the 1540 is also slightly faster. there are only 39 buttons, so unlike the 4148r's 48 keys, a shift key is required, designated by F. operation is straightforward and there are some useful touches, like the ee exponent ranging, d-r which switches mode between degrees and radians and also doubles as a converter. brackets are only to one level and there is no operator precedence (eg 2+3*5=25). usefully the batteries are not sealed inside the machine. the battery pack is removable and is essentially a holder for 3 AA cells, which can be either disposable or rechargable.